Preheat frying oil to 375. Place the beaten eggs, milk and salt in a shallow bowl. In a shallow bowl (or another large baggie), mix together flour, cheese, garlic powder, thyme, oregano, paprika, cayenne, and pepper. 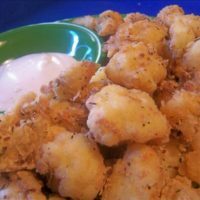 Place cauliflower into egg mixture and toss to coat well. 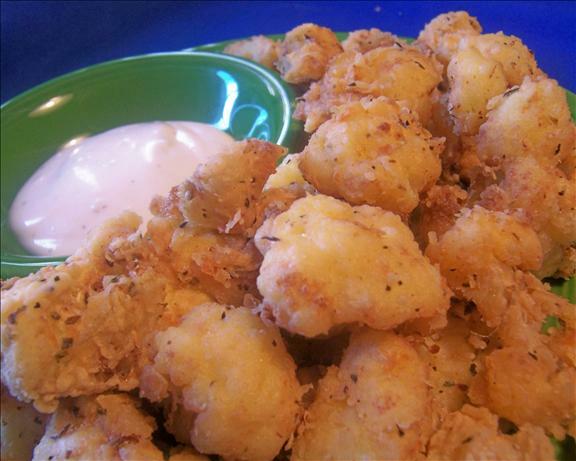 Remove cauliflower and place into flour mixture and toss to coat well. Fry in batches for 4 – 6 minutes or until golden brown. Drain on paper towels and lightly salt. *Serve w/ dipping sauces such as marinara, ranch or blue cheese.